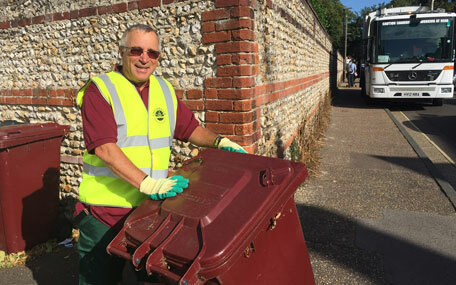 Residents across Chichester District are being thanked for their hard work in helping raise recycling rates as part of the council's Recycle50% campaign. "I want to thank everyone for helping to increase the amount we recycle in the district," says Councillor Roger Barrow, Cabinet Member for Residents' Services at Chichester District Council. "We measure the rates on a quarterly basis and over the last two quarters, we have been recycling over 45% of household waste. This is great news, but because the rate can fluctuate throughout the year, we want to work with residents' in order to maintain and increase it even further." holding roadshow events during nationwide Recycle Week to talk to residents about what can and cannot be recycled. supporting the West Sussex Household Waste Prevention Team at local events as part of their outreach programme. launching a number of information videos on the council's YouTube channel showing what can be recycled in Chichester District. a social media campaign to help answer residents' questions and promote the wide variety of things that can be recycled across the county. providing information on what material in the black waste bin can actually be reduced, reused or recycled. completing a successful project with the West Sussex Waste Partnership which focused on recycling at properties with communal bins. This included providing face to face recycling advice, reusable bags and updated signage. through the West Sussex Waste Partnership Community Engagement Team, speaking to over 1,000 residents to understand the barriers to recycling to help improve future communication campaigns. specific targeted communications and messages on what can be recycled and where. developing a new service leaflet with key waste and recycling information that will be sent out to all residents this April. This year, the council will be introducing a bin sticker scheme to help remind people what can be recycled. Work will also take place to help reduce instances of contaminated recycling created through people not putting the right items in their burgundy bin. "Most residents have reacted extremely positively to the campaign, which is reflected in the rates - but we can always do more," explains Cllr Barrow. "One of the things we want to do is to ensure that the recycling we collect is of a high quality so it can be reused and made into new things in the future. Although most residents are doing all the right things, we do still have some issues with a minority of residents who persist in placing the wrong items in their individual recycling bin. "Because of some problems we have experienced, we have now revised our recycling bin contamination policy to help deal with these situations. This means we now have the power to give fines for persistent contamination. I must stress though, that this is a staged process, and it is a tool that we would only use as an absolute last resort, where all other methods have not been able to resolve the situation." Residents who want to find out more about what they can and can't recycle can visit our recycling pages. People can also follow the council's Facebook page for regular updates and the Twitter page .